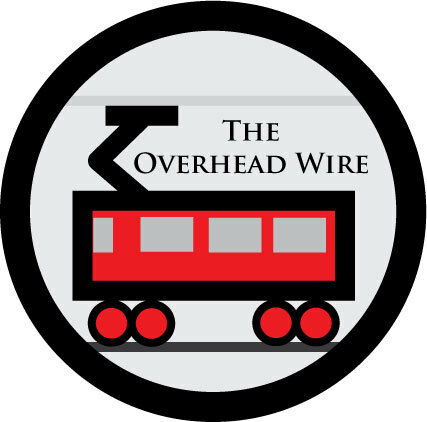 The Overhead Wire: On the Subway? Southern Methodist University's proximity to DART's rail and bus lines was a key selling point in picking Dallas as home for the library, said Laura Bush, an SMU graduate. She told a Waco TV station in January that the Bush complex would be the only presidential library on a subway stop. I didn't know being on a subway stop was so important to the Bushes. It's not really a subway stop anyway but light rail in a trench. 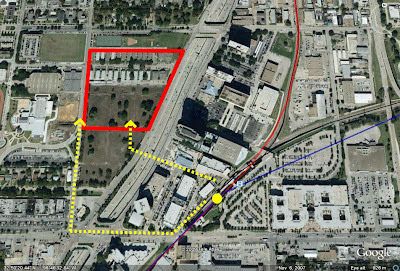 Apparently the library really won't be on the stop, but instead across a major freeway from Mockingbird Station. They thought about building a bridge but decided against it. It's a half mile walk from the station using the existing road bridge. If they installed the ped bridge, it would take off .3 miles but would be more exposed to the elements and car traffic on the expressway below. Ultimately it's pretty close to the light rail stop, but why transit matters to a legacy that was down on transit to begin with is beyond me. why transit matters to a legacy that was down on transit to begin with is beyond me. For the same reasons that Manhattan developers who build gated communities in the suburbs take the subway to work. Why would the average transit user even be interested in going to the Bush library? It should be pointed out that if Austin gets its way, there will be a light rail line that goes right by the Johnson Library at UT. Also, the Kennedy Library in Boston is about a mile from a T stop. Why would the average transit user even be interested in going to the Bush Presidential Library indeed? So? Dallas has a light rail station in a subway (Cityplace), but it's south of Mockingbird. That must have been a confusion. Bush Administration provided $1.3 billion for Seattle light rail. The Little Rock streetcar was extended to the Clinton Library. Then there is the JFK stop on the red line in Boston. Okay, the last comment really didn't have anything much to do with presidential libraries, but I put it in anyway. The Jimmy Carter Presidential Library is in Atlanta, but MARTA Rail doesn't serve it currently. It is, however, near the route of the proposed Beltline LRT line, and I hope there will be access there soon when they get it.